“Sweaters and lunch,” my co-pilot points ahead. The flock of sheep being herded across the road ahead can’t tell the difference between our Range Rover Evoque and the grass they crop. Their herder smiles at our SUV, waves, and keeps his charges off the broken pavement while we buzz along a ridge framed by a sea so vibrant blue it has its own Crayola. I’m bald, so this is the one Grecian formula I aspire to: sun, sea air, and the promise of salty local feta for lunch. The Evoque’s a Birkin bag of an SUV, a coded symbol of wealth that orbits the regal Range Rover as its more compact, more fashion-forward companion. The 2020 Range Rover Evoque couldn’t be more out of its element, blazing ahead of grazing sheep, but it still evokes a Milan runway—even here when the nearest runway periodically has to be cleared of ovines before take-offs. With the latest Evoque, Range Rover’s stiletto shape takes a softer set. The original seemed to be cleaved from aluminum like origami. This time, Land Rover’s drawn it with more heft. Big wheelhouses fit available 21-inchers, tall doors and trim windows merge more quickly at the tail. It’s a British SUV that looks like it’s been chopped and channeled into a Chanel suit. The effect has only been made more dramatic with thin LED headlights and on correctly ordered R-Dynamic models, with black wheels and roof and coppery highlights on the fender vents. It’s matured inside too, ditching some of the more buoyant touches of the first Evoque for some of the warmer touches that cropped up on the Velar. Crisp digital displays embed themselves in the dash, in the gauge cluster, even in the rearview mirror—but the Evoque’s clean, linear cabin can be wrapped in eucalyptus-fiber cloth or, sensationally, in a wool blend that drapes and takes stitching like a finely tailored suit. Leather’s so last season, anyway. 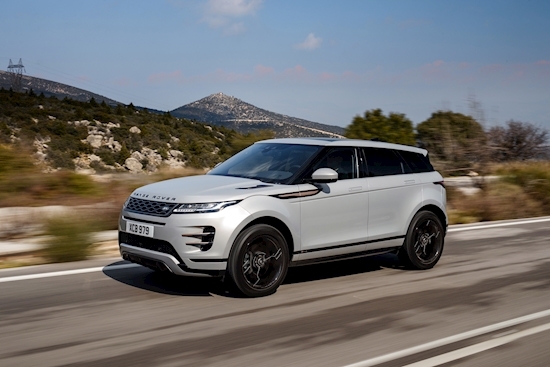 With zingy turbo-4 engines, all-wheel drive, a 9-speed automatic, and a stiffer body, the 2020 Range Rover Evoque puts its marker down on street performance, with some off-road talent kept in reserve. Power thrums from a 2.0-liter turbo-4 tuned two different ways. We’ll have to report later on the more powerful model: Its 296-rated horsepower clip off 0-60 mph times of 6.3 seconds, pushes the Evoque to a 150-mph top end, and comes paired with a set of adaptive dampers for what’s promised to be flatter, more precise handling. It sounds like the “S” equivalent in a lineup sure to spawn an eventual Evoque SVR—but it’s still a mystery to us. For our Greek cruise we drove the lower-output Evoque, looping wide around Athens traffic (on Greek independence day, of all days) and wending across the mountaintops of the Peloponnese on roads that ranged from primitive to perfect. Here, the base 246-hp version of the Evoque turbo-4 rarely met a Peugeot hatchback it didn’t want to pass, though it strained a bit on uphills, toting something like 4,400 pounds between car and drivers. Land Rover quotes a 0-60 mph time of 7.0 seconds and a top speed of 143 mph, just incrementally slower than the R-Dynamic model’s higher-output engine, but markedly quieter and smoother than the old Evoque turbo-4—the engine’s mounted closer to its midline for less vibration. A revamped 9-speed paddle-shifted automatic shifts cleanly, with an occasional burpy upshift overshadowed by tightly packed low gears that make the most of the engine’s low 1,300-rpm torque peak. R-Dynamic editions get adaptive dampers and sport drive modes, but the “P250” 2020 Evoque gets the pass-through benefits of the stiffer body and redesigned suspension. It’s still struts in front, but a rear integral-link setup on loan from the Velar and hydraulic bushings in front go far to quell the Evoque’s jittery old ride, even on the 20-inch Pirelli Scorpion tires fitted to our test car. This Evoque threaded its way through downward-spiraling turns with a composed, unruffled set, and scrabbled its way through uphill bends with the help of electronically induced torque-vectoring across the rear wheels. While it pointed and squirted on its way there, the Evoque demonstrated enough skill on gravel paths and goat trails to earn the Land Rover badge, even if it doesn’t pretend to approach Defender territory. With its off-road drive modes tuned for snow, mud, sand, or rocks, the Evoque also gets hill-descent and hill-climb control that all but leaves trail-riding to its computerized brain. It’s so sophisticated that it’s adopted a new camera system that knits together images from the nose and near the wheels to show drivers an unobstructed view of the ground below the car—it’s an X-ray view of the craggy road ahead. That’ll help keep the expensive chin spoiler intact. With all-wheel drive and cameras aplenty, the 2020 Evoque also stocks standard automatic emergency braking, and its rearview camera can also display an unimpeded view to the rear. It also gets standard LED headlights, Android Auto and Apple CarPlay compatibility. A bare-bones $43,645 Evoque isn’t very bare but still seems like an opportunity missed. We might spec an R-Dynamic car with its mild-hybrid 48-volt pack and adaptive dampers, given the chance to drive one. We’d absolutely trim one out in the Kvadrat wool interior, with black wheels, a sliding panoramic glass roof, high-end Meridian audio—and Firenze Red, one of the only colors offered that isn’t gray, white, or black. At its finest, the 2020 Range Rover Evoque’s comes in at about $55,000. The price of looking good always has been a little dear. Land Rover paid for airfare and hotel so we could provide you with this first drive review. Stay tuned for more on the mild-hybrid Evoque P300, just as soon as we can drive one.